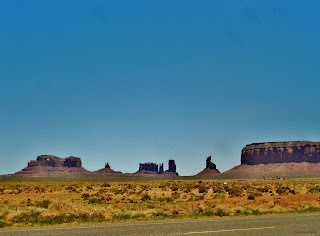 The Southwest Through Wide Brown Eyes: First Time in Monument Valley was a Bust...a Busted Tire That is. First Time in Monument Valley was a Bust...a Busted Tire That is. Recently, Roy and I were very fortunate to be able to go on a guided tour of Monument Valley, but that wasn't our first time there. Well, lets say it wasn't our first time there, but it was the first time we got to see a major part of it. Alright, lets go back in time to 2009 and the decision to finally get to the Valley. Then, we only had passenger cars, so decided to take Roy's Grand Am; I had a small digital camera with only 7 pixels, so many of the photos were not the greatest. Going past the town of Bluff, you have to make sure to pay attention to the road signs. 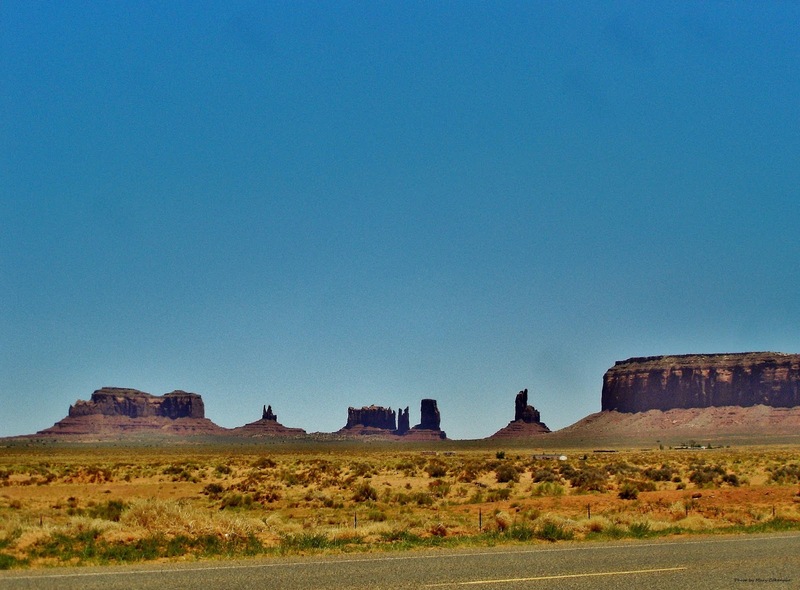 There is a point where Route 191 splits off to the southeast, and you want to continue your travels on Route 163 which goes directly to Monument Valley. The landscape along the twisty road is amazing and eventually you will see a little sign that indicates the entrance to Valley of the Gods. This is a gravel road, so not having a 4 wheel drive vehicle at the time put this on our "to-do" list. Another road recently put on our "to-do" list, and is before you reach Mexican Hat, is Route 261; Valley of the Gods, Goosenecks State Park and the 3 miles of switchbacks called the "Moki Dugway" eventually end you up at Route 95 and near Natural Bridges National Monument. 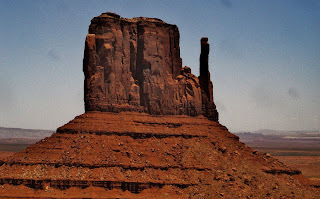 Digressing here; you know you're getting near to the little town of Mexican Hat when you see, well what else, the Mexican Hat formation. There is a pull in spot along Route 163 for photos, or you can travel the gravel road that goes directly to the formation itself. 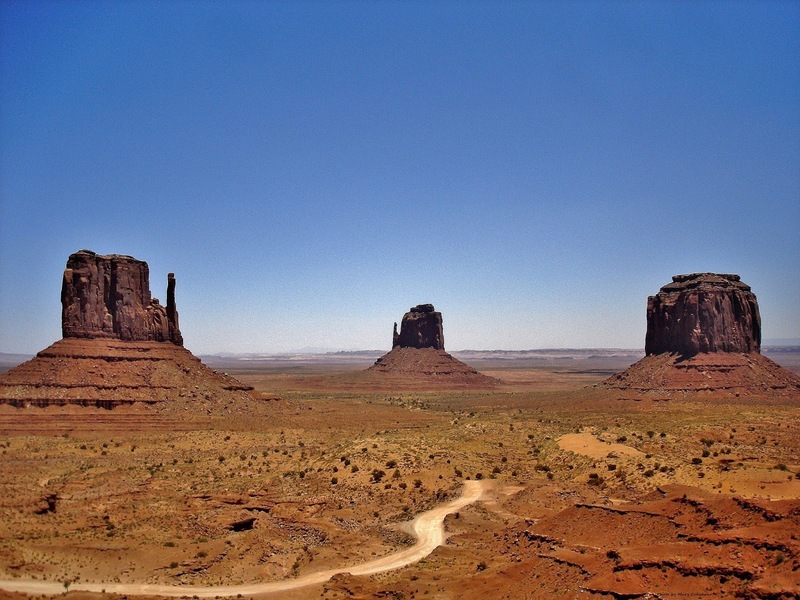 The town of Mexican Hat is also your last rest stop/gas up the vehicle place before you reach Monument Valley. After passing Mexican Hat, the landscape takes on a more intense look; walls of rock with "waves" or "goosenecks" carved by wind and rain; formations large and small; and then in the distance you begin to see the outskirts of the Valley. Your heart may skip a beat or two in excitement and anticipation. Warning! Drivers will become overwhelmed by the sight of Monument Valley; all common sense and knowledge about the rules of the road will go completely out of their heads. Keep a distance from vehicles as they will make a sudden stop directly on the road or pull off with screeching tires onto gravel lined, unlevel viewpoints. Passengers with cameras are likely to walk onto the road without a single glance in either direction for moving vehicles. Consider yourself warned. I will admit that we were one of those drivers who suddenly pulled onto one of those gravel lined viewpoints and I bet that is how we got our busted tire....but the story continues. As you get closer to the Valley, the road still gives a twist here and there, but it is when you go over that last hump that the most glorious site fills your eyes. It is that classic scene from movies, like "Forrest Gump", that most have seen and wished to see up close and personal...we got that chance. The sight is simply amazing! As you get closer, it just keeps getting better and better! Eventually you will reach a crossroad, one way is the entrance to Monument Valley where you'll pay your fee ($5 per person), go to the Visitors' Center, check in at the View Hotel (if you're staying there), go on a self guided tour, or one of the guided tours. Another way is towards Goulding's and I'll be writing about that at another time; but I highly recommend one of the guided tours they run...great experience! Of course you can continue on straight along Route 163 into Arizona and wherever it is you're traveling onto. Anyway, we paid our fee, parked at the Visitor's Center and looked over the Valley from the terrace. Indescribably beautiful; again a classic photo scene...The Left and Right Mittens, and Merrick Butte. No photo can do it complete justice, especially once you've seen them directly in front of you. We were getting ready to do the self guided tour when we saw it; one of the car's tires had split, the rubber that is. No way were we going to attempt the tour; there was no where to get a new tire, so the only option was to limp home and get it repaired in Monticello. Talk about disappointment! Then again, it was a blessing of sorts also. The self guided tour is very short; if you want to get a more intense experience, then you have to go on one of the guided tours. Basically, most of the roads are either private (yes, people do live in the Valley as they have for centuries), or only accessible via a guided tour. Oh, the roads down there, yeah, about that; honestly, unless you are a complete maniac and truly hate your vehicle..do the guided tour. First off, someone else is doing the driving for you; second, the Navajo guides are wonderful, and why not, it is their heritage they're telling you about. You'll hear stories and information that no guide book has, related in proud voices. This is not the last story about Monument Valley, you can bet good money on that.